This is a fun way to get your kids to eat a variety of vegetables. 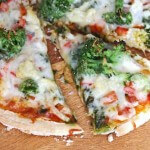 Use their favorite vegetables to top this pizza. Leftover vegetables make perfect toppings. Spread pizza sauce evenly on pizza crust. Add small dollops of pesto on pizza. Sprinkle broccoli, bell peppers, onions, garlic, and then cheese on top. Bake 8-10 minutes until cheese is melted and crust is lightly browned. I used broccoli that had been steamed until just tender, about 5 minutes.